ALAMEDA, Calif. � Vice Adm. Linda L. Fagan recently assumed command of Coast Guard Pacific Area during a change-of-command ceremony at Coast Guard Base Alameda. Fagan relieved Vice Adm. Fred M. Midgette, who served as the Pacific Area commander since August 2016. Previously, Fagan served as the Deputy Commandant for Operations, Policy and Capabilities, where she was responsible for establishing and providing operational strategy, policy, capability and resources to meet national priorities for U.S. Coast Guard missions, programs and services. Fagan is the Coast Guard�s first Gold Ancient Trident, a recognition by the Coast Guard for being the officer with the longest service record in the marine safety field. In this role, Fagan serves as an advocate and senior advisor for the service�s prevention workforce. Fagan has a Bachelors Degree in Marine Science from the U.S. Coast Guard Academy, a Masters Degree in Marine Affairs from the University of Washington and a Masters Degree in National Resource Strategy from the Industrial College of the Armed Forces. Under the command of Midgette, a native of Virginia Beach, Virginia, the Coast Guard men and women of Pacific Area interdicted over 210 vessels and detained over 700 illegal narco-terrorists, ultimately removing more than 250,000 kilograms of cocaine from the maritime approaches of Central and North America. Additionally, he exercised the nation�s only arctic ice-breaking capability, supporting national-level scientific research through two Operation Deep Freeze deployments to the Antarctic, and he increased commercial and military activity through the Arctic and Northwest Passage during Operation Arctic Shield. After serving more than 36 years, Midgette retired during a separate ceremony following the change of command. Pacific Area is the Coast Guard�s regional command element and force provider for maritime safety, security and stewardship in the Pacific. The command�s area of responsibility encompasses six continents, 71 countries and more than 74 million square miles of ocean. 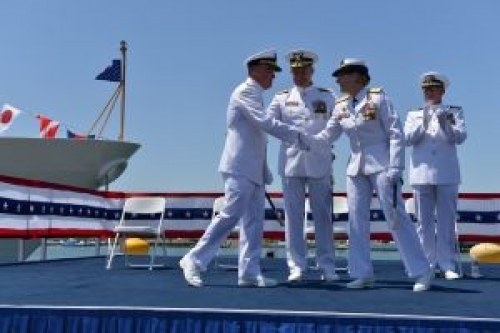 U.S. Coast Guard Commandant Adm. Karl L. Shultz presided over the ceremony. The change-of-command ceremony is a historic military tradition. The event, which has remained unchanged for centuries, includes a reading of the command orders in the presence of all unit crew members to ensure continuity of command.